Lawmakers Juan Guaido, center, President of National Assembly, Edgar Zambrano, left, first Vice President and Stalin Gonzalez, right, second Vice President pose after being sworn in during a special session at the National Assembly in Caracas, Venezuela, Jan. 5, 2019. Venezuela's opposition-run congress on Tuesday issued a resolution calling deals between state-run oil company PDVSA and U.S. and French companies announced this week illegal, since they had not been sent to lawmakers for approval. The body said the oilfield deals with France's Maurel & Prom and little-known U.S. company Erepla violated article 150 of Venezuela's constitution, which requires that contracts signed between the state and foreign companies be approved by the National Assembly, as Venezuela's congress is known. "They are giving concessions that violate the law," said lawmaker Jorge Millan, mentioning the two contracts. The deals are part of Maduro's effort to reverse a sharp decline in the OPEC nation's crude output that has crippled its economy. Erepla said it would invest up to $500 million in three fields, while Maurel & Prom said it would invest up to $400 million for a 40 percent stake in an oilfield joint venture. 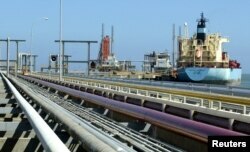 FILE PHOTO: An oil tanker is seen at Jose refinery cargo terminal in Venezuela in this undated photo. A spokesman for Erepla, registered in Delaware in November and part-owned by a prominent Florida Republican donor and shipping magnate, said Venezuela's hydrocarbons law "allows PDVSA to contract with companies like Erepla to execute field services without any additional approvals required." Referring to the Erepla deal during the congressional session earlier on Tuesday, Millan said that while PDVSA referred to the agreement as an oilfield service contract, "the company will be conducting oil exploration and production activities." Maurel & Prom Chief Executive Michel Hochard said the company would act "in accordance with the instructions given" by Maduro and Oil Minister Manuel Quevedo, according to a statement attributed to him in a PDVSA press release.